The roots of the recent Taiwan-PRC tension are derived from the One-China Policy, or the 1992 Consensus. The policy was agreed upon in 1992 by the then-ruling Kuomintang government of Taiwan and the PRC. It definitively states that there is only one China, however, each side is allowed to bear their own interpretation. In other words, both the PRC and the ROC are allowed to claim that they are the sole legitimate government of China, which includes Taiwan as well as Hong Kong and Macau. This policy would supposedly form the basis for negotiations between the two sides, and it implied that Taiwan would eventually unify with the mainland. However, in the time since 1992, the balance of power shifted between the two Chinas dramatically. Between 1992 and 1996, democratic reforms allowed for Taiwan to transition from the one-party state to a liberal democracy, which consequently allowed for both pro-independence parties and candidates to flourish. In 1996, Taiwan began holding direct elections for its president and vice president. This had a dramatic effect on the identity of Taiwanese citizens. 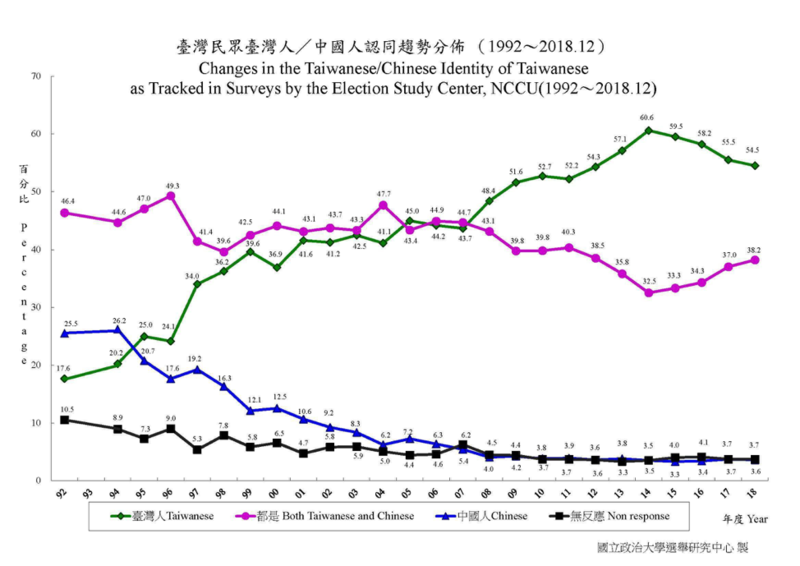 Polling from the Election Study Center at National Chengchi University suggests that the percentage of people in Taiwan who identify only as “Taiwanese” surged, while the percentage of people in the same group who identify only as “Chinese” fell to single digits (Figure 1). Similar polling indicates that the Taiwanese electorate prefers to maintain the status quo, whether that means to sustain it indefinitely or to decide on unification/independence at some other date; the same polls also indicate that only a small minority of voters prefer immediate unification or immediate independence (Figure 2). Thus, Tsai’s repudiation seems to have struck a chord amongst the Taiwanese populace. In the aftermath of this rejection, Tsai saw her approval rating surge by about ten points to 34.5% within a couple weeks, according to the Taiwan Public Opinion Foundation. This comes despite her party – the Democratic Progress Party, which favors independence – losing key races in the 2018 elections. Moreover, the DPP seized the opportunity to condemn members of the opposition party, the Kuomintang (KMT), who did not outright reject Xi’s proposal, most notably Wu Den-yih, the KMT party chairman. Many interpreted his statement that he supported peace talks with the PRC as too dovish on the threat at hand. This tactical move by the DPP forced other members of the KMT to distance themselves from appearing to be acting against the perceived interests of the Taiwanese people. Tsai Ing-wen’s approval ratings since January 2016. Graph created using data from local polls. In other words, foreign policy was not at the forefront of the voters’ minds, and thus the 2018 elections cannot be seen as a referendum on Tsai’s approach to China. Instead, local issues, such as a stagnant economy, were greater factors contributing to the DPP’s defeat in 2018. The election coincided with an aggressive diplomatic campaign by the PRC against Taiwan by convincing several of Taiwan’s allies to sever official diplomatic relations with the island and instead recognize the primacy of the People’s Republic in exchange for certain economic and trade benefits. This left the Taiwanese government with few remaining diplomatic allies, who are mostly small and undeveloped countries such as Belize and Nauru. However, one of its significant allies, the Holy See, remains a powerful player in international affairs, particularly in cases such as the thawing of relations between Cuba and the United States during the Obama administration. Yet, it is being pressured by the PRC to reach a compromise over the communist government’s role in Catholic Church’s faith in China. With the election of Pope Francis, the Church has become more willing to appease the PRC, which could result in further moves away from its traditional ally – Taiwan. Further measures enacted to pressure Taiwan into submission include restricting the number of tourists from the mainland, interfering in Taiwan’s elections, and demanding airlines, hotels, and other commercial entities remove references to Taiwan as an independent country. Currently, a consensus among voters in Taiwan and the government of the mainland does not exist. Even if the Kuomintang secure power in the 2020 presidential and legislative elections, abiding by the One-China Policy will become an increasingly difficult challenge. In particular, managing the cross-Strait relationship while appeasing a voter base that wants to maintain the status quo requires the ability to walk a fine political line. Similarly, this is something that mainland China should keep in mind when crafting foreign policy toward Taiwan, especially given some policies may yield unintended effects. A recent example of this is an incident that occurred before the 2016 election. In January 2016, Taiwanese K-pop star Tzuyu was pressured to make a video apology for holding Taiwan’s flag on South Korean television. This infuriated many Taiwanese people, who saw that there was nothing to apologize for, and may have contributed to Tsai Ing-wen’s landslide 2016 victory. For China, reunification with Taiwan remains a key strategic goal. In short, it would represent the absolute victory of the Communist Party over the Republic of China as well as reining in an economically prosperous, renegade province. However, by pursuing an increasingly aggressive strategy, China’s foreign policy objectives seem no closer to coming to fruition. Furthermore, Taiwan remains heavily dependent on U.S. support, whether it be from the assurance of intervention in the event of war between the two Chinas or through U.S. military support. Though, China, with an annual military budget of $144 billion compared to Taiwan’s $10 billion annual budget, continues to develop new military equipment and AI technologies at a breakneck pace. This threatens to make a U.S. intervention more costly and thus less feasible, especially amongst a war-weary populace, and the theory among some Chinese strategic planners is that the United States would recognize that the cost of defending Taiwan would not outweigh the benefits of maintaining an independent country. Thus, in order to maintain regional stability and to ensure peace, Taiwan will need to carefully manage the cross-Strait relationship in the coming years. Because of its diplomatic isolation and lack of participation in international organizations, there may be a growing tendency to push for a referendum on Taiwanese independence; however, this may cause Taiwan to lose support from the United States, given that official U.S. policy is to comply with the One-China protocol. On the other hand, Taiwan’s economy remains reliant on the cross-Strait bilateral trade relationship, accounting for nearly a quarter of Taiwan’s total foreign trade. Taiwan and China also signed a trade agreement, the Economic Cooperation Framework Agreement (ECFA), in 2010, further strengthening these economic ties. Disrupting the status quo could cause large macroeconomic repercussions for Taiwan. This could also diminish Taiwan’s ability to claim territory far away in the South China Sea in line with the same nine-dash line used by the PRC, although a recent ruling by the International Court of Justice ruled against China’s claims in the South China Sea. This also nullified Taiwan’s claims to the area, but these rulings were unsurprisingly rejected by both Beijing and Taipei, especially as Taiwan currently occupies and controls Itu Aba (also known as Taiping) the largest feature in the hotly contested Spratly Islands. The President of the Council on Foreign Relations, Richard N. Haass, writes that “the risks for all concerned are high. It would be best to avoid symbolic steps that would be unacceptable to the others. The status quo is admittedly imperfect, but it is far less imperfect than what would follow unilateral actions and attempts to resolve a situation that doesn’t lend itself to a neat solution.” Turning the Taiwan Strait into a potential flashpoint for military conflict could destabilize the Asia-Pacific region. Given the unpredictability of the situation as well as China’s anti-secessionist law, which authorizes the use of military force against Taiwan in the event of a declaration of independence, great care must be taken in order by both sides to ensure that war does not break out. Apr 17 Can India and Pakistan find a resolution?